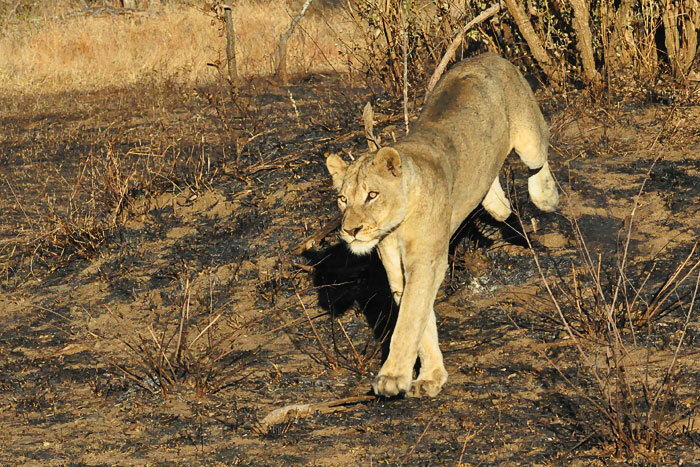 One of the Sparta lionesses runs towards a herd of buffalo. All together again, these five lionesses were on the hunt for something big this week: we found them almost every day close behind a herd of 500+ buffalo. Unfortunately, they were not successful, but hungry enough that in one sighting they even changed their tactics and went for an impala lingering nearby. This marks the first time we have seen all five lionesses reunited for longer than a few days, since the killing of their cubs by the Majingalanes. 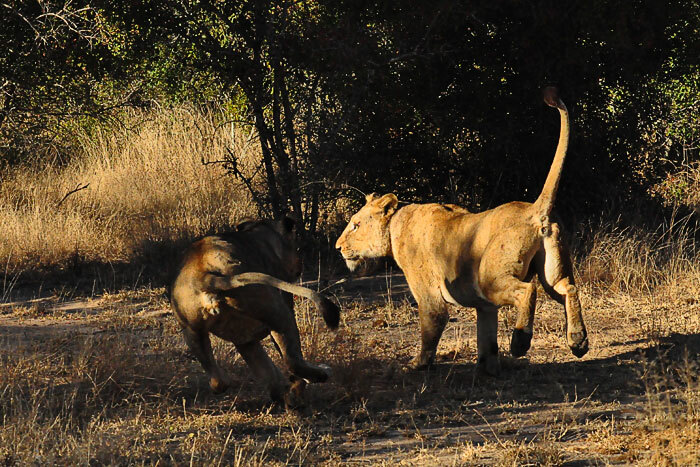 Two of the Sparta lionesses play after missing in their attempt to catch an impala. At times this week, it seemed they were more playful, and perhaps excited about being reunited, than truly focused on their hunting. 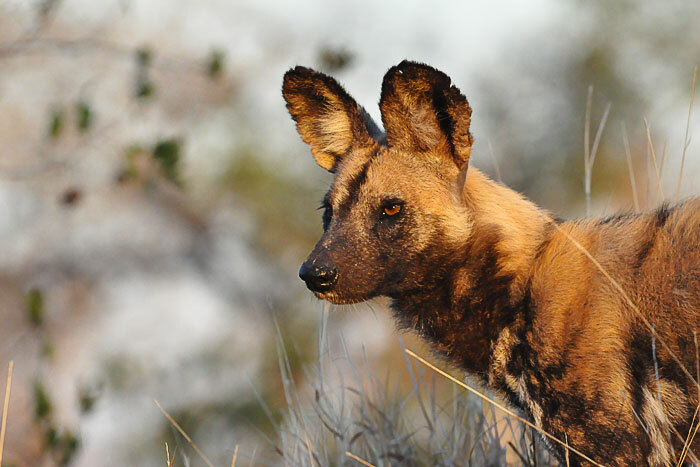 The Wild dogs returned to Londolozi on several occasions this week. Here, the alpha female of the pack investigates a termite mound as a potential new den site. She eventually moved off, apparently deciding it was not up to par. 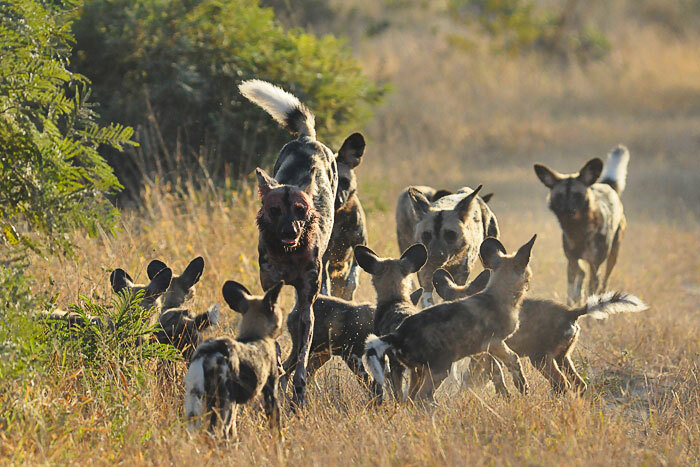 One of the adult Wild dogs returns to the pack, exuberant in clearly having made a kill. True pack animals, when this individual returned, the dogs all yelped with excitement and ran around him in circles until he ran back the way he came at full tilt, leading the rest to the carcass. 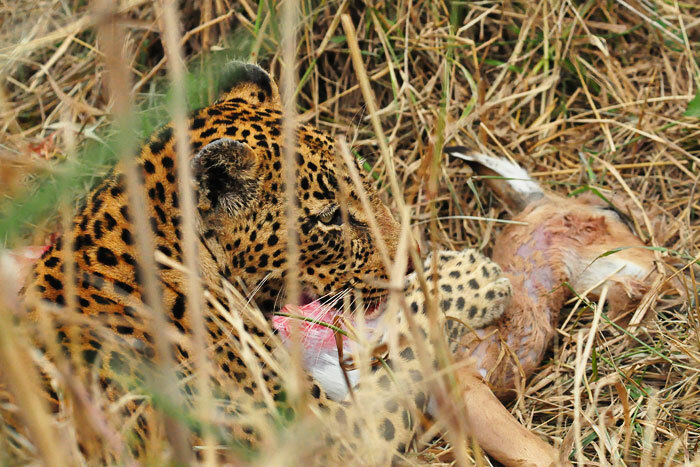 Unfortunately, however, by the time they reached the dead impala, mere seconds after he had left it, most of it had already been consumed by hyenas. 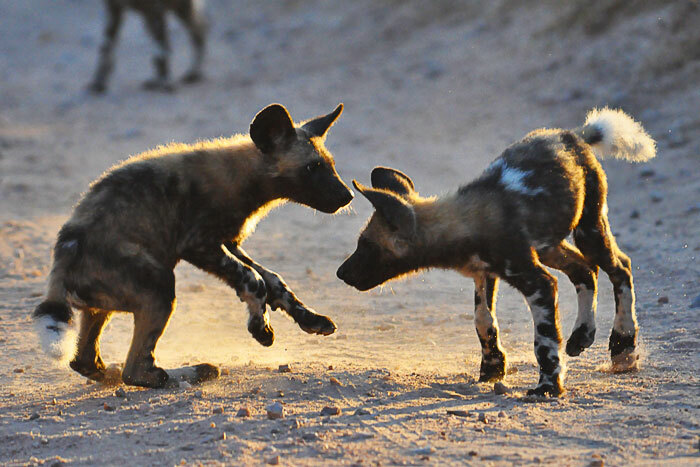 Two wild dogs pups play in the first morning light. At about 3 months old now, they are following the adults hunting, although can't quite keep the pace just yet. This leaves plenty of time for shenanigans! 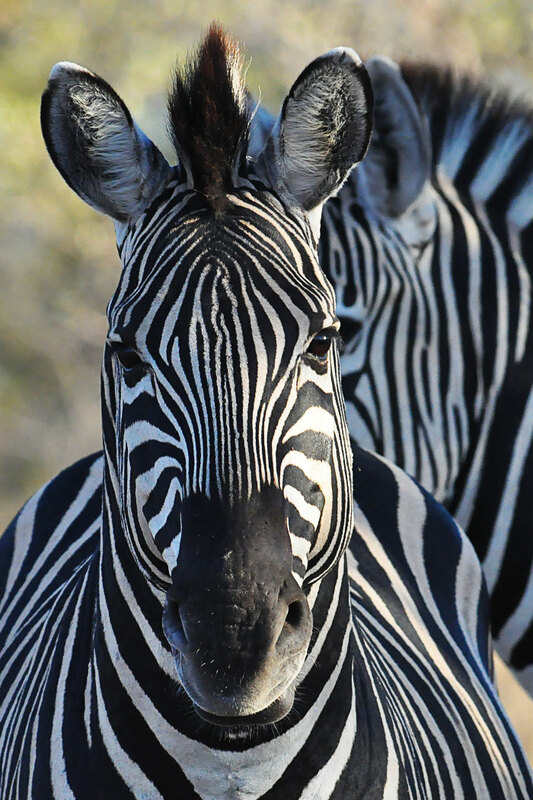 A heavily pregnant zebra is curious about our presence. After spending 12 months gestating in the womb, the foals are not born in any particular season, which is why this mare looks about to pop even in the dead of winter. In fact, the survival rates of the foals has been shown to be more a result of synchronized birthing within a group than time of year. 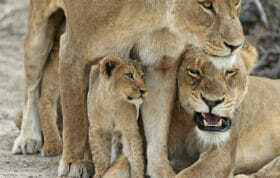 The Tsalala Pride, with their cubs, have been keeping very well hidden lately. We were pleasantly surprised when we saw this lioness on the northern bank of the Sand River, at the start of afternoon game drive. She was covered in blood and on her way for a drink, panting heavily. We were certain she had made a kill, but she kept us in suspense for a while. Finally she led us to her prize: an adult waterbuck cow which we estimated she and her sister had killed minutes before we found her. 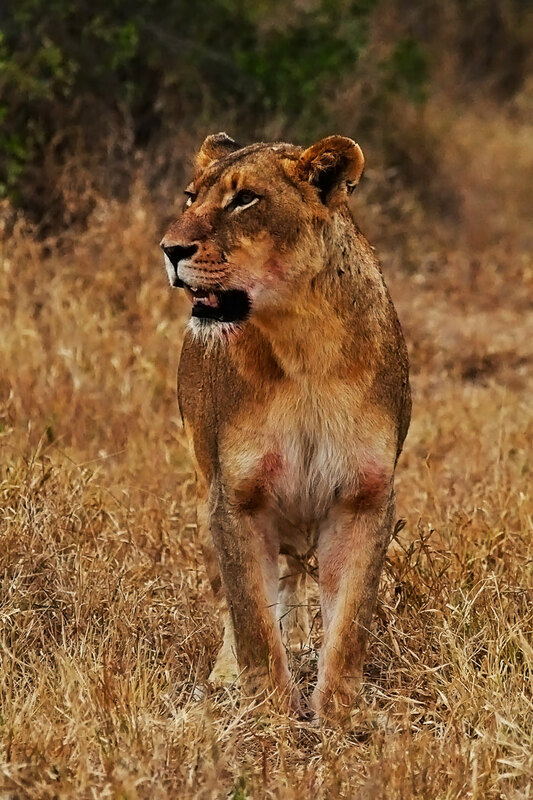 Feeling extremely lucky to have seen this lioness, especially considering none of them had been seen in over a week, we were even more surprised when her attention was grabbed from feeding to a rustling on a nearby crest. Her sister, the mother of the older cubs, had gone to fetch her youngsters and brought them to the kill! The Tsalala cubs were ecstatic about the bounty. 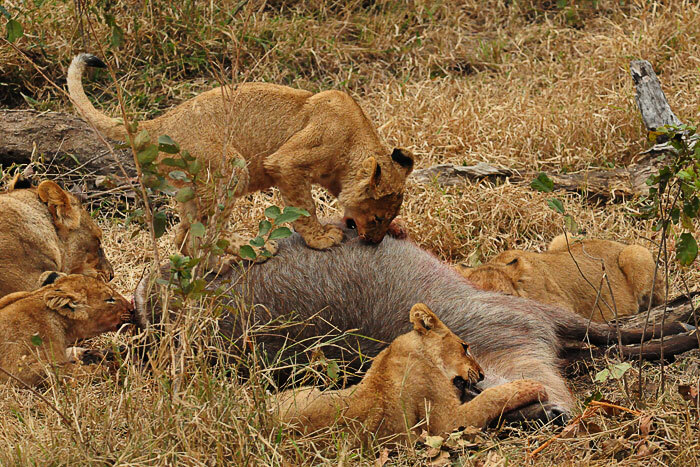 Before feeding, however, they first used the opportunity to 'practice' hunting. For a good twenty minutes they pounced on the carcass as though they were taking it down! The one male of the four seemed particularly convinced that this was a real hunt! One of the three females is intrigued by the head. 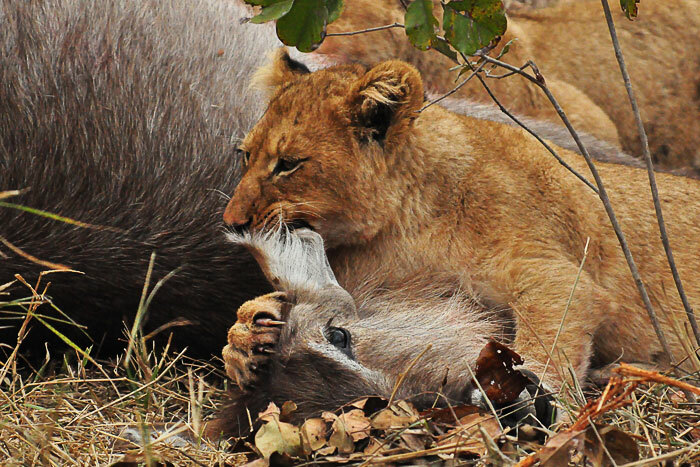 This will help in future hunts, as quite often lions will try to suffocate their prey by covering the mouth or crushing the throat. 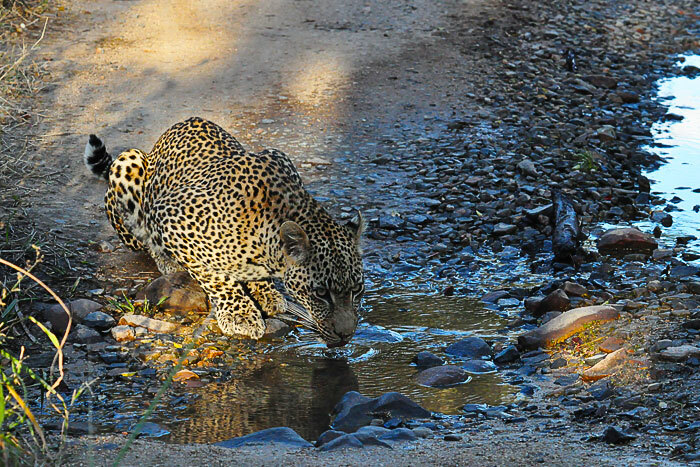 The Nyeleti Young Male drinks from Camp Donga. When we first found him, we did not recognize him because he was out of his usual realm. As far as we know, this was the first time he has come south of the river. He walked straight through camp at three o'clock in the afternoon! This striking sunset was the result of a layer of smoke in the evening sky, created by a controlled fire intentionally started to make a fire break. 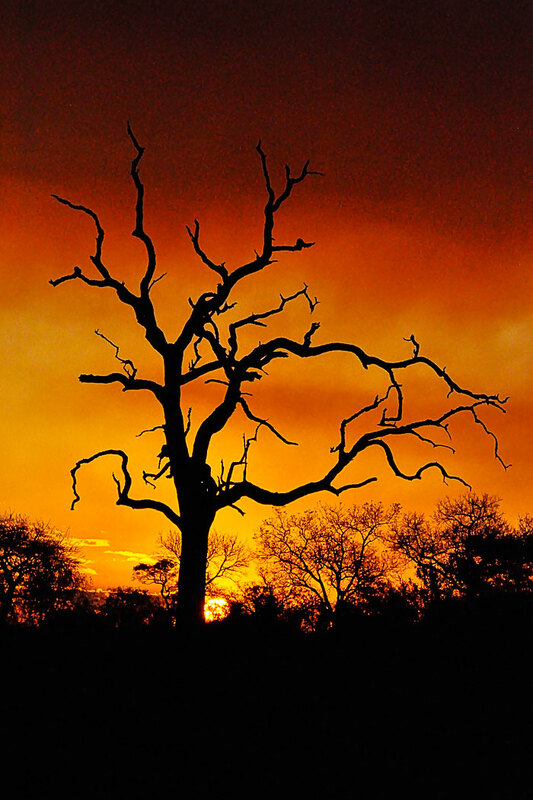 The purpose of these breaks is to prevent the spread of lightning or accidental fires at the end of the dry season by providing a fuel-free barrier between blocks of the very dry, and hence flammable, bushveld. Obviously not a candidate for 'Photo of the Week', I included this shot as a reminder that some of the most amazing sightings we have aren't necessarily the most photographic. When my tracker and I located the Vomba Female on foot, she was still heaving from having killed an impala and dragged it into the bush. Once we were able to relocate her with the vehicle and our guests, she had caught her breath enough to think about feeding. 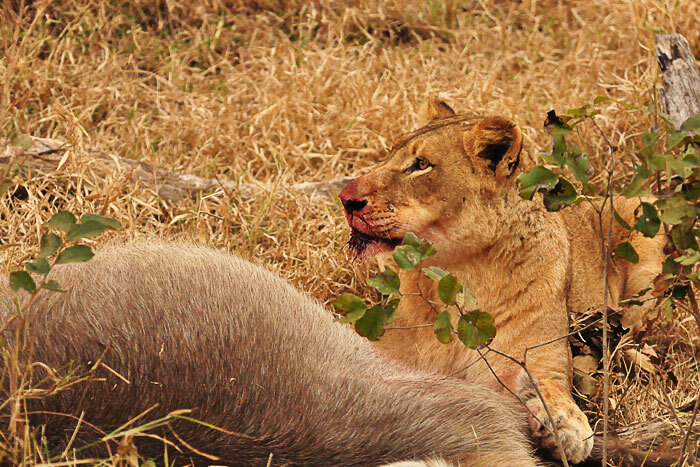 She dragged the carcass right next to the vehicle, plucked off some of the fur, and began eating. 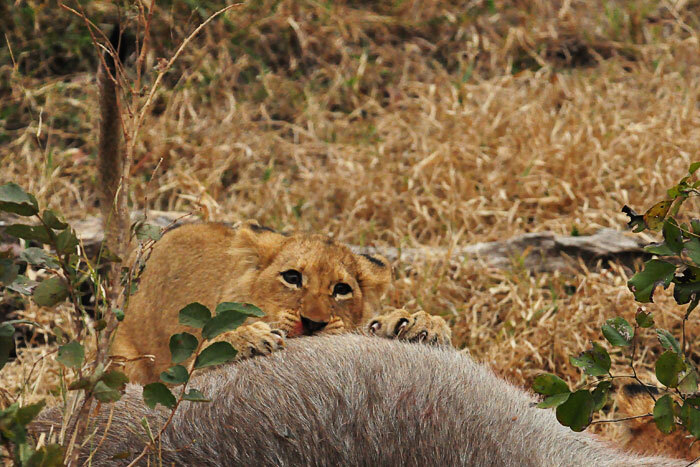 Even though the grass was in the way, this sighting was unbelievably intense because of the proximity of sounds and smells: the ripping off of the fur, the crunching of the bones, the smell of the flesh, and the silence when she paused to look out for hyenas. After removing the organs and hence a large portion of the weight of the impala, she hoisted it into a nearby tree, carefully selected for its height and dense branches. 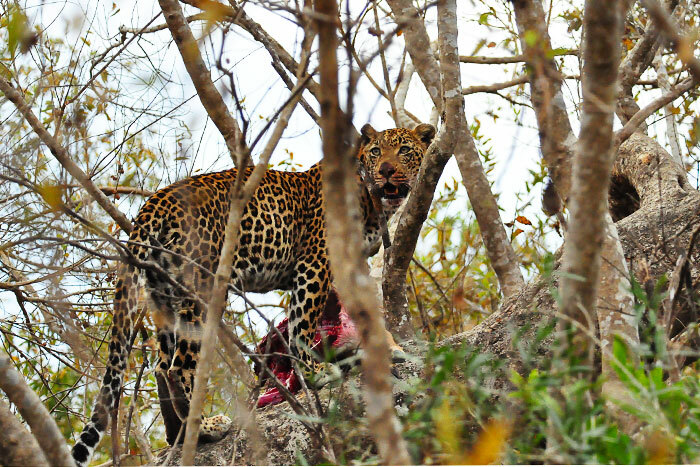 Seeing a leopard actually carrying a kill into a tree is definitely not something you see every day, and once again, not always perfect for photographs! Regardless, this entire sighting really put us in her shoes and reminded us of the immense effort it takes for these animals to secure a meal. As if the visits from the Wild dogs weren't enough this week, another endangered species made an appearance! 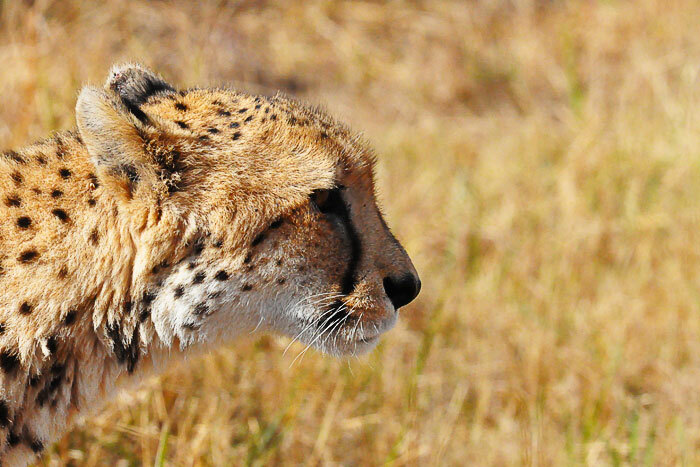 This beautiful female cheetah was seen twice hunting impala in the open clearings. Being extremely vulnerable to other predators, particularly lions, cheetah always need to be fully alert to their surroundings. She was very relaxed with the vehicles, but her ears were almost always turned backwards, scanning to ensure there was no danger lurking. My favourite sighting this week, despite all of the exciting predator viewing, was coming upon a zebra only about an hour old. It was still wet and unable to stand when we first found it! WOW! 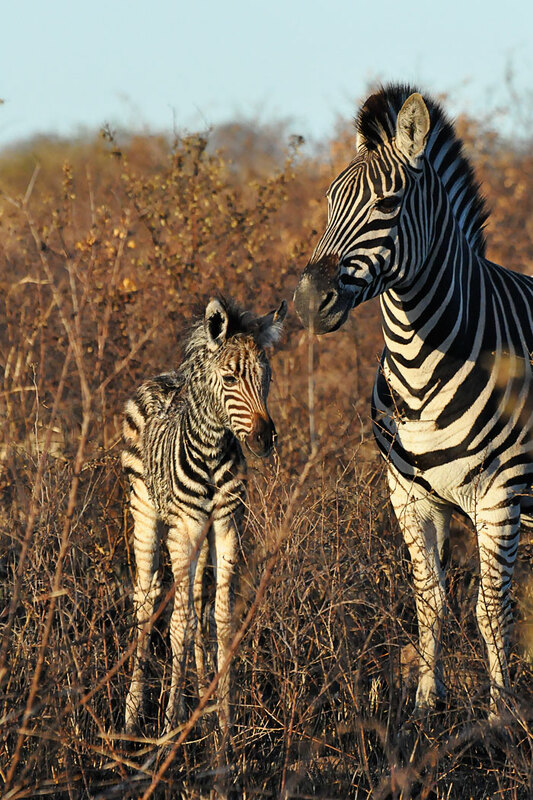 love the Zebra foal and the Nyeleti Young Male drinking and the cubs hunting practice pics are just sensational. in fact – these are all sensational, and like you said – even if its not optimal photography – you can’t ask a leopard or any wild animal to “move a bit right please, I would like to get a clear shot” haha, its all about the moment. makes it even a little more special. 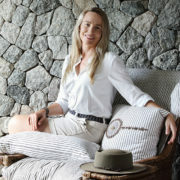 More sensational photos! Talley, you are a GREAT photographer. This week has been great. I already miss you guys and it’s been 4 hours. The animals were unbelievable! How nice to view the pictures of our wonderful week with you. 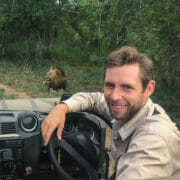 I miss our game drives with you although sitting on the terrace of our water villa makes it a little easier. Life here is also very nice but totally different. I have to get used to the marine creatures. But I will definitely follow Womba’s life and also that of all the other animals. Your pictures are really great. I can see that Thomas is also writing to you. Have a nice time at home. This is the best blog I’ve come across in long time – the pictures and the stories are fantastic. Thank you. Unfortunately my nice letter didn’t reach you. We enjoyed every minute, being well aware, that we have experienced a big basket of luck during the drives with you. But we know just as well, that your and miltons skills, humour and great company were outstanding and adorable ! It will not surprise you, that we also vividly remember your farewell at the runway, standing on our rover with waving arms. Thanks a lot for everything, don’t forget us and let’s stay in touch.